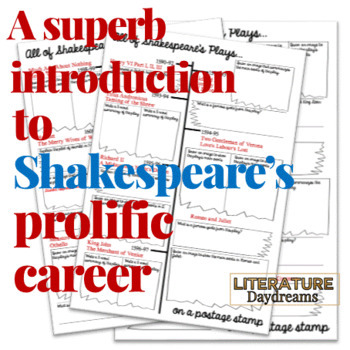 Shakespeare remains one of most prolific writers of all time. 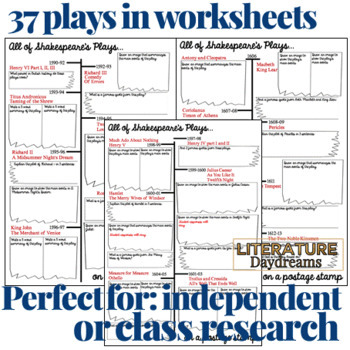 37 plays written, performed and published in less than 25 years. 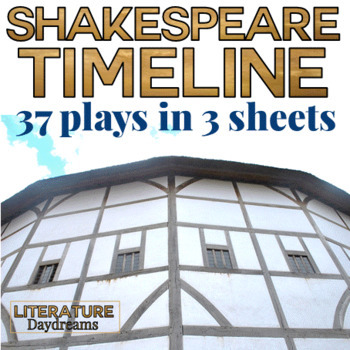 These 3 worksheets allow your students to create a timeline of Shakespeare's plays. 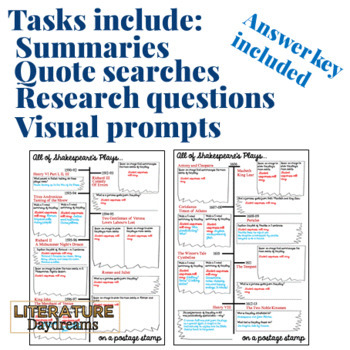 Students will need to research key details about each play in order to complete the tasks which include - writing summaries, drawing a visual representation of the action, finding key quotes, and answering research questions. Please note: As I am based in the UK, some of my documents contain British spelling. I am very careful about ensuring that this does not impact the spelling on any worksheets. Please contact me directly on literaturedaydreams@gmail.com if you have any questions about my products..